Bogle provided complete architectural and structural design services including construction administration for this rural retreat on 10 acres. Site design included layout for separate garage, workshop and outdoor amenities. 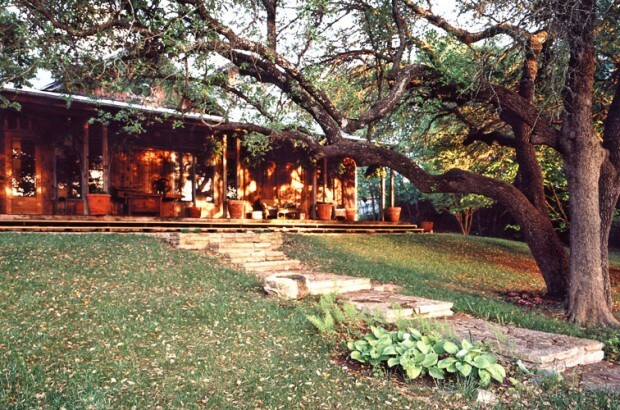 The home is sited to engage the natural landscape, nestled below a bluff and facing a live oak grove and pond. Existing knolls with dense, diverse plant-life were preserved to the north and south of the site selected. Traditional forms and construction techniques were implemented with exposed glued-laminated wood beams and wood roof deck exposed. An open plan provides fluidity of space and sense of the outdoors from all rooms, with vistas through the house. An operable return-air system was implemented to allow capture of warm air from upstairs during the heating season. Daylighting with a combination of windows and skylights provides passive lighting in all major spaces. locally-quarried silaceous limestone exterior and honed flooring, western red cedar, galvanized metal roof, insulation above the roof deck, insulated glass wood windows, daylighting, custom white oak entry doors, custom bronze gratings, custom beveled glass “brand” window, zoned heat-pump HVAC system. Posted in homes. RSS 2.0 feed.